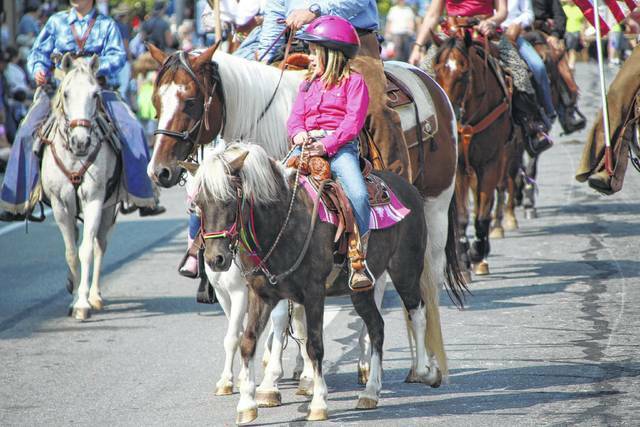 Riders of all ages and sizes participated in the annual All Horse Parade on Sunday in Delaware. Spectators lined the streets of the city to catch a glimpse of the wide range of horses featured in the event that warms up local residents for the Delaware County Fair. High school marching bands from Buckeye Valley, Delaware Hayes, and Olentangy Orange entertained the crowds along the route. According to officials from the Delaware County Fair, it’s one of the largest annual horse parades conducted east of the Mississippi River. The county fair opens Saturday, Sept. 16 and runs through Saturday, Sept. 23. For information, visit www.delawarecountyfair.com. See The Delaware Gazette on Facebook and Twitter at @delgazette for more images from the All Horse Parade.